What does the “Pursuit of happiness” really mean? Beyond it being a unalienable right, some say it’s the ability to simply have a job, provide for a family and enjoy a baseball game on a Sunday afternoon. Others work to position themselves in a career that makes them happy, pursuing their hobbies and passions. The real question is why can’t you do both? Enter, stage left, Adam Woodhams. Adam represents the seemingly small percentage of individuals who think the passions that drive you, can be utilized for daily well-being. While always an auto-enthusiast, it wasn’t until purchasing his B6 A4 in 2003 that Adam knew cars are what he wanted to work with indefinitely. He joined Eric @ Supreme Power to begin building a knowledge for the aftermarket auto industry and to enhance his sales skills. Not far into his new career, Adam realized there seem to be a consistent amount of complaints about aftermarket rotors cracking under duress. Being a marketing / business major, he took it upon himself to investigate the sources and procedures of various aftermarket rotor companies and concluded there was a opportunity to bring a new approach to the table. Adam proceeded to source premium blanks for his B6, but instead of utilizing the traditional “drilled” pattern, he chose to implement a “dimple” pattern for essentially the same effect. The concept is simple: if you do not drill through the entirety of the rotor, it will not crack, as it’s still one solid piece uncompromised. With the dimpling though, you get the same effects as a slotted rotor, and the same look as a drilled rotor. 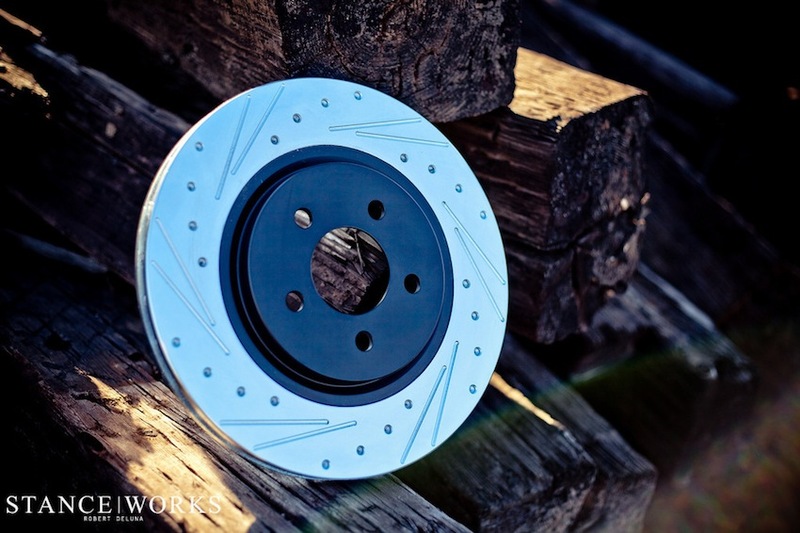 Mr. Woodhams will be the first to say, “this isn’t anything new or earth shattering,” but what he had done was utilize premium materials to produce crack-proof rotors while still looking stellar and all at a nominal price. People started to take notice, due mainly to Adam’s great photographic abilities, and began to inquire about how they could get a set. He slowly began selling them, but without a name as he was simply just helping people out in the midst of doing his daily duties at Supreme. It wasn’t until Adam was browsing Audizine, that he noticed a member had in their signature mod list a set of “Adam’s Rotors.” At that point, the brand was established. With the S8, it was important for Adam to do something he had yet to do and air was the challenge. Not a small feat, mind you, as there are very few who have gone to the necessary extents to lay out one of these land yachts. Universal Air Systems, known for the versatility of their bags, was the route chosen. Hard Parker Garage was given the liberty of hacking away at the factory struts, along with fabricating custom bag perches. Through several nights of trial and tribulation, a beautifully laid out S8 was redeemed. Wheel selection is also crucial in delivering presence when it comes to car builds. For that, Adam teamed up with his good friends over at DPE. 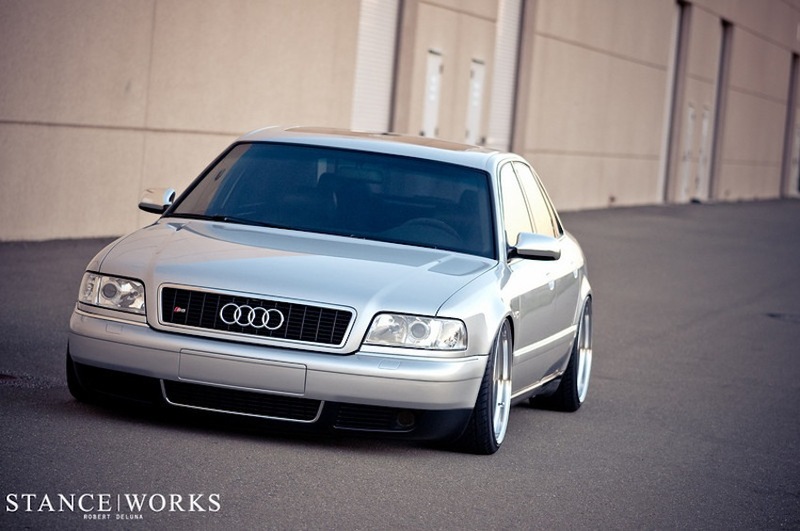 They were able to produce something classic, but with a nice step lip that could pair with the performance-oriented S8. The DPE R05 2-piece was the chosen wheel design made in 20x9.5" et10 square with staggered back-pads. 235/35's round off the clearance issues, giving the setup a nice stretch. The interior did not go without receiving some similar tender care. Adam chose to send off the interior trim to oCarbon. Each piece was hand wrapped and laid with a larger cross-hatched weave, giving the interior the attention to detail it deserves. The S8 wheel was sent off to Brothers in Arms to be wrapped in beautiful perforated alcantara with red cross stitching. The combination really accentuates how well these cars were built from the inside out. The details continue on, just like the details that go into what Adam's Rotors is today. Through the years, Adam and his team have even ensured that their "drilled" patterns will not crack. Strategically drilling amongst the internal venting structure of the rotor, avoiding the vent ribs, and pairing with chamfered holes, the concern with cracking is eliminated. Adam has successfully taken the concept of replacing rotors, and made it into a bespoke venture. Each order is "made to order," with 12 different patterns to choose from. The options don't stop there has you have 3 different zinc coatings to choose along with a slew of hub coatings. Adam has quite literally brought the concept of "cool" to replacing your brake rotors. One has to wonder, where else can you honestly take brake rotors? Let's just say the future is filled with possibilities, and Adam intends to see them through. Stay tuned, because this is not the last you will see of Adam's Rotors! First!… 5 stars to you, Adam. This is tasteful in every way, and my respects for not only creating new rotors but also daring to pick an unusual platform. I mean, how often do we see a gen-1 S8, let alone tuned up like this? Nice work on the words and pictures too, guys. This is the reason why I keep coming back to this blog for more every so often.